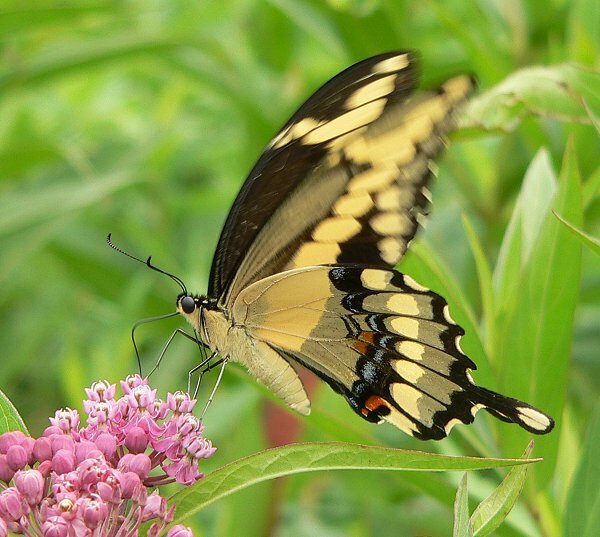 Giant Swallowtails are largest butterflies we see here – their wingspans can be up to 6 inches – really breathtaking the first time I saw one. 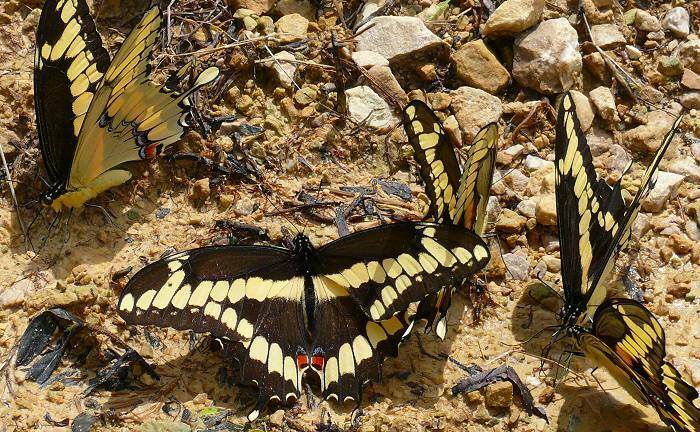 We often see them puddling on the gravel driveway, and sailing along wide trails through the woods. They don’t seem to overwinter here – I usually start seeing them at the end of May. My earliest sighting was May 3, 2012. 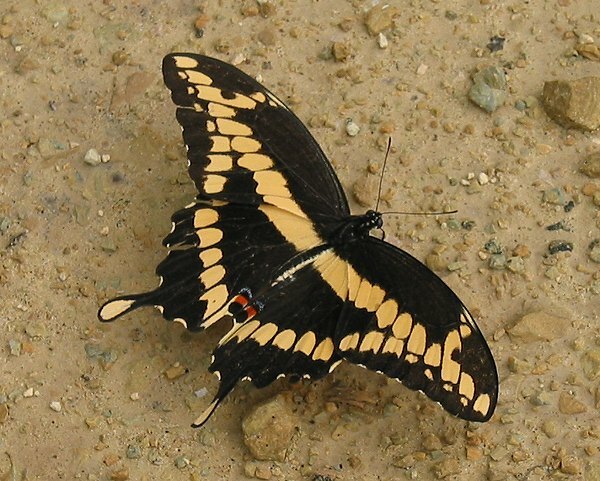 Like Eastern Black Swallowtails, these butterflies often hover while they’re nectaring so their forewings are constantly moving. The only time I’ve seen them hold very still is when they’re on a rocky or sandy surface, like a driveway, soaking up sun or salt. 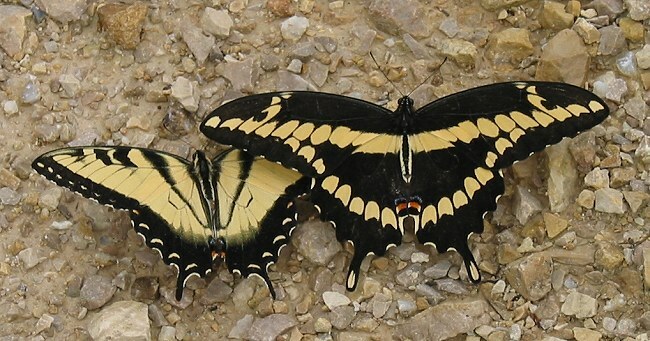 Here’s a photo that shows how much bigger they are than the more common Tiger Swallowtails. 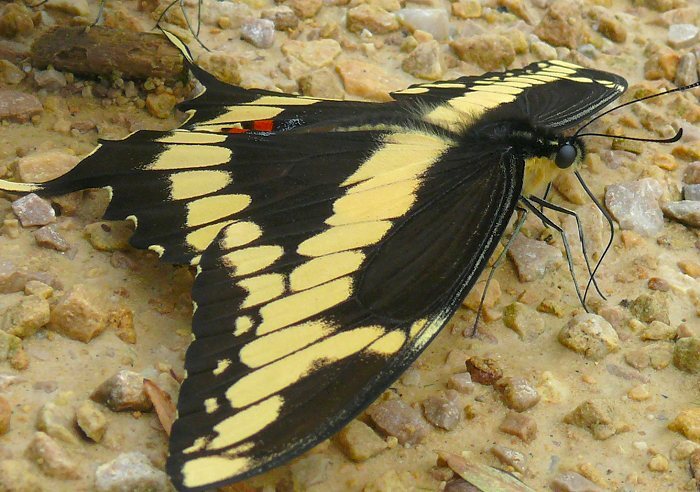 Giant Swallowtail caterpillars eat plants in the citrus family. 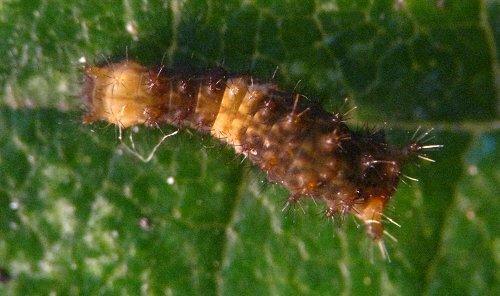 In the southern states they’re called “Orange Dogs” and are considered pests on citrus trees, but in this area they eat Prickly Ash. 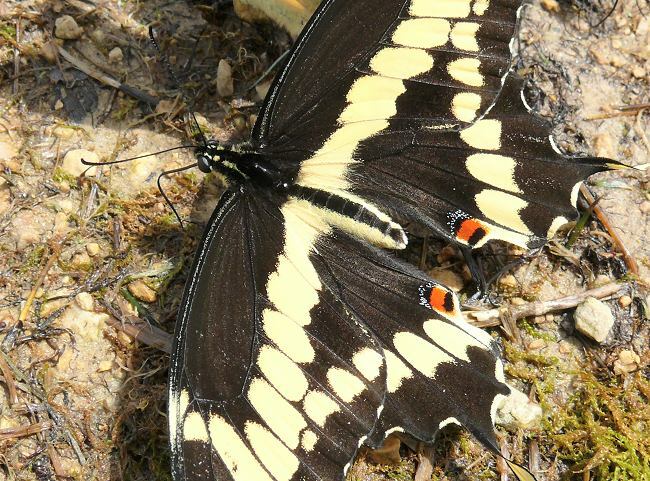 I usually watch them carefully when I see them in the woods, because I suspect most of those butterflies are females looking for places to lay eggs. 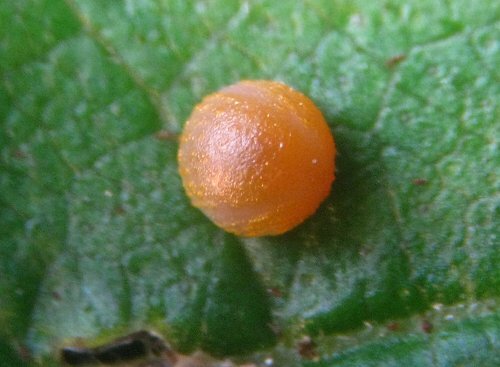 Here’s a later instar. 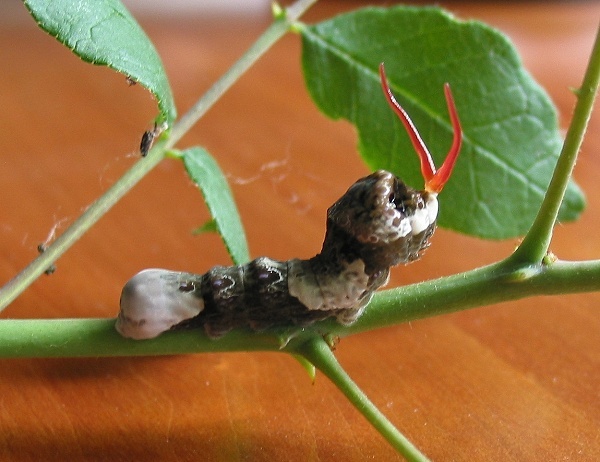 The two red tentacles on its head are called an osmeterium. 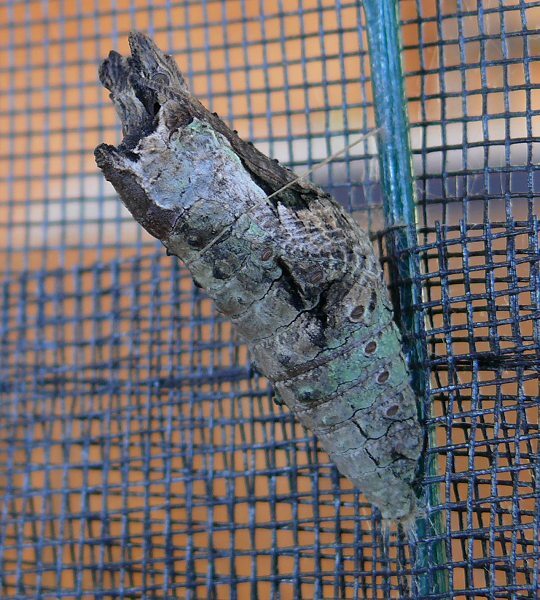 They come out and wave around if the caterpillar is startled or handled. 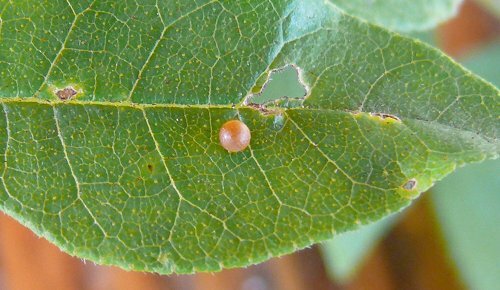 The caterpillars look a lot like bird droppings – probably very advantageous since they hang out on the tops of leaves, where they’re very visible. 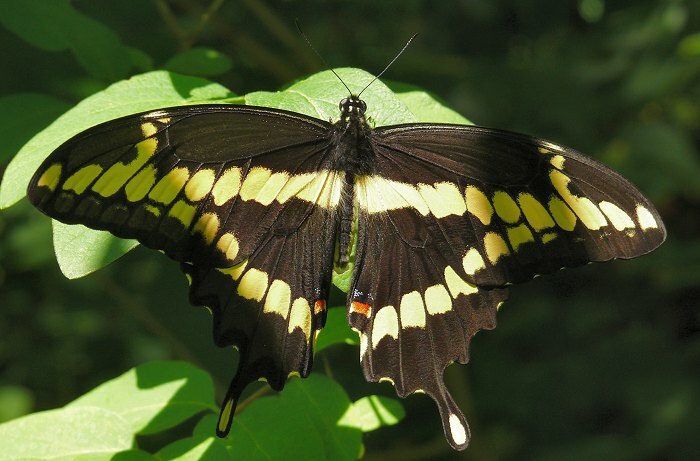 In August of 2002 we saw more Giant Swallowtails than I had ever seen before at the farm. 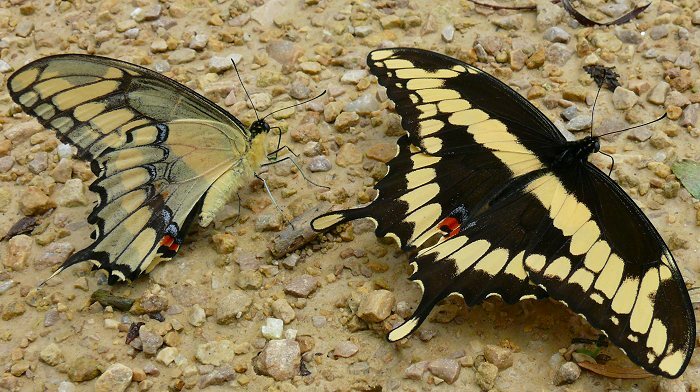 They were puddling on the driveway, nectaring at the flowers, and flying though the air everywhere. Here’a a group of them on the driveway. 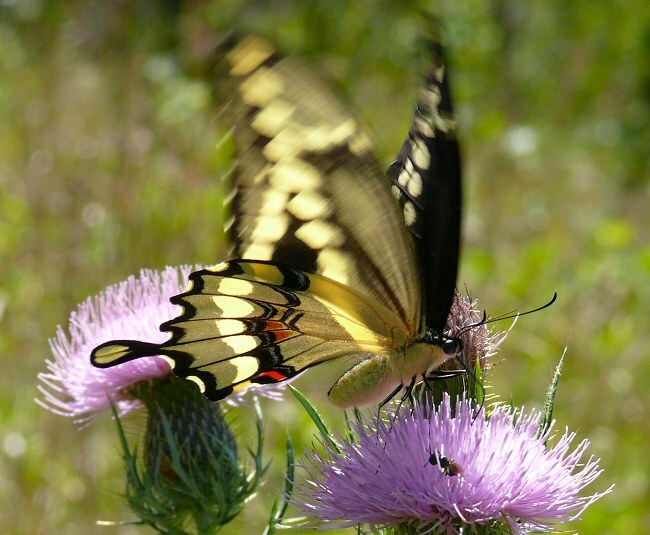 Thistles and milkweeds are some of their favorite flowers for nectar. 2008 was another good year for them. One morning in June I counted 16 puddling on the driveway. Here are a few of them. Showing off both the upper and lower sides of the wings.